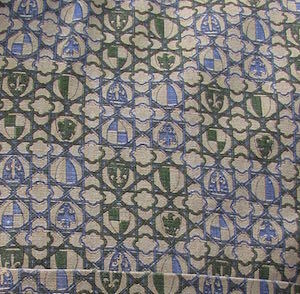 (XL,Tall) Mens Vintage 1950's Shirt, Shades of Green, Purple, Coat of Arms Print! 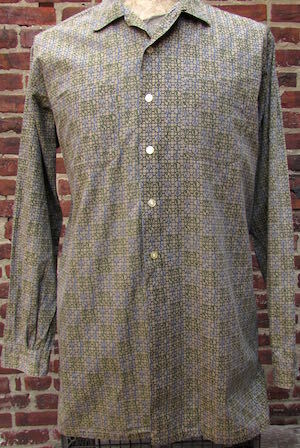 Home > Items just added 4/3-4/17 > (XL,Tall) Mens Vintage 1950's Shirt, Shades of Green, Purple, Coat of Arms Print! Mens Vintage 1950's Cotton Shirt! 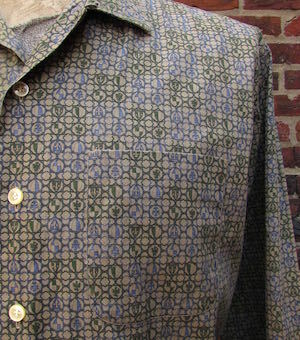 Shades of Green, Light Brown, and Pale-Purple with a funky coat of arms print, including a Fleur de Lis! Five buttons down the front with one more on each cuff. Rounded patch pockets on both sides with a straight hem. Loop neck, smaller collar with a gentle gathering of fabric at the cuffs. Tagged by Sport King. No material tag but feels like 100% Cotton.